Mount Baden Powell - San Gabriel Mountains - Beyond Limits on Foot! To get to the trailhead: Take the 15 North from San Bernadino. Head west on the 138 for about 8.6 miles; turn onto the CA-2 West. Stay on this for about 14 miles until you hit Vincent gap. Don’t forget to buy an adventure pass or if you have your annual pass make sure it’s displayed. The drive was long, but we still got a 9:30 AM start-time. Something interesting: 40 switchbacks to the top. The top of Mount Baden Powell is 9,407 feet and is the 4th highest peak in the San Gabriel Range. The last hike we did was Mt. Baldy, which summits at 600 feet higher, but this hike was just as challenging and beautiful. From the beginning we started counting 40, 39, 38… switchbacks left. We began at an elevation of 6565 feet at Vincent Gap, which divides Mount Baden Powell from Blue Ridge. We were obviously heading toward Baden Powell’s summit and continued on counting down the switchbacks, which felt endless. A lot of the area is full of Jeffrey, Ponderosa, Londepole and Limber Pines (some are said to be more than 2,000 years old). 37, 36, 35, legs, legs, my legs. That’s right you’re not going to get much rest on the legs as it is all moderately uphill. We passed a small bench about a mile in, to stop or not to stop. We didn’t stop until hit only 25 left. Before the 15th switchback there was an off-trail to go to Lamel Spring. Some people turned off here, but we kept trotting up the hill. At this point we started feeling the elevation while breathing. After a short break more up and more up, heaving breathing, spectacular views, but we still managed to make it to the top a little under 2 hours. CHECK! But before we hit the top we stopped at 3.9 miles to check out one view after another after another. 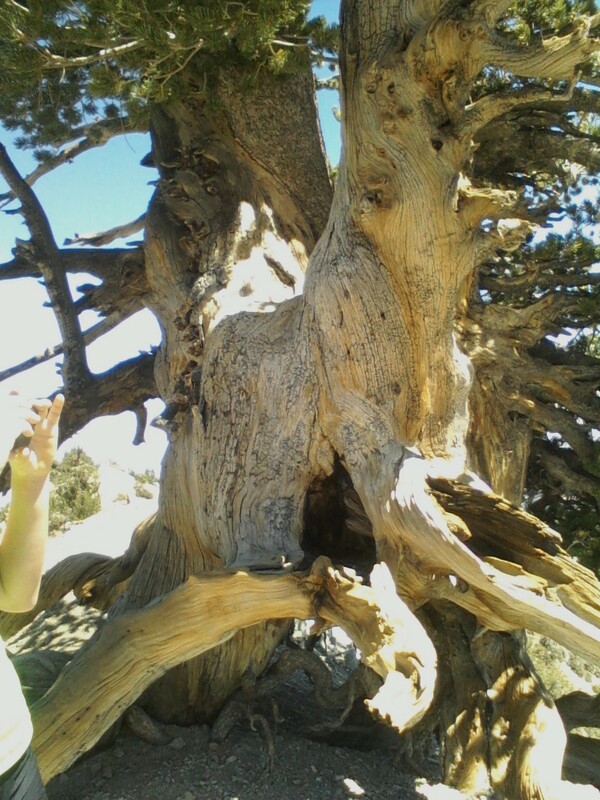 Starting with an ancient grove of limber pines that have been there for more than 1,000 years, then Pine Mountain Ridge and Mount Baldy, then a drop in the ridge you are standing on and then take a stop at the Waldron Tree (an interesting looking limber pine more than 1500 years old). We found a little shaded area, where the bees wouldn’t leave us alone and soaked up the cool afternoon breeze while eating our cold sandwiches and drinking a “refreshment”. At the top we were able to see the Mojave Desert and the Southern Sierra. Something that makes me want to do this hike again: Every single switchback has a view and it’s always a different kind of view. This makes it even more pleasant than it is already. In 1957 the Boy Scouts of America placed a marker at the summit with a plaque dedicated to Lord Baden-Powell. The way down took half the time as it hurt on our knees to go slowly, so we jogged down the switchbacks all the way down to the parking lot. It felt endless, but we managed to finish the hike with no headache, no exhaustion, just a little soreness on the legs. Must do hike for anyone who wants to train for a backpacking trip. Note to self: Water, water, water.